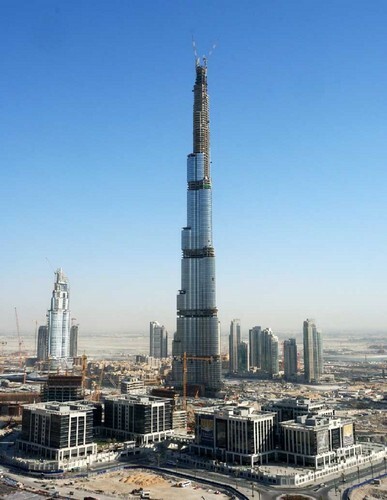 The Burj Dubai when finished will be the biggest tower in the world. It took around 330 thousand cubic meters of concrete, 39 metric tons of reinforcing steel and 142 thousand square meters of glass to build it. The builders of the tower come South Korea, America and the UAE. A man called Adrian Smith designed the tower. And the project is from EMMAR. The tower will be 585.075 meters when finished. There are more than 3000 workers building the tower. To get the concrete to the top they use 11 concrete pumps and also they use cranes to get material and workers to the top. The tower uses advanced technologies in construction for example self-lifting blocks to build walls and cages made from prefabricated steel rods. The tower is 33 thousand square feet at the bottom, but much smaller as it gets higher and higher. The tower when it is finished will have high speed lifts which move at 2 meters a second which is about 120 floors in a minute.